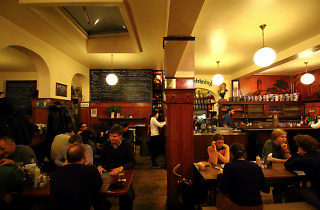 Apfelwein-Wirtschaft Fichtekränzi is a prime example of a traditional, rustic Frankfurter Apfelwein tavern, and it’s a firm local favourite. 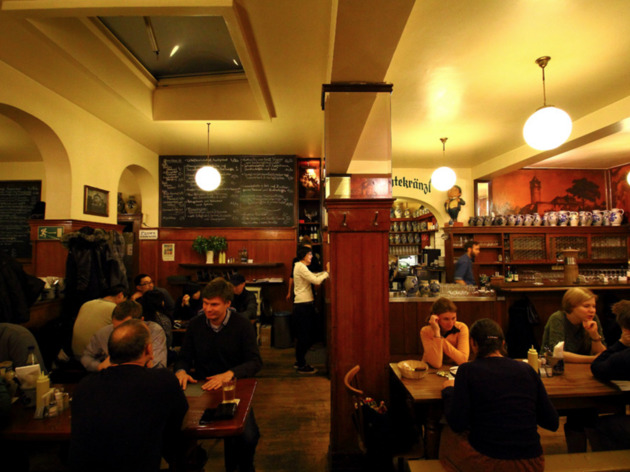 It’s noisy, lively and fun, and you should expect to share tables with other diners and drinkers when it’s busy—and Fichtekränzi’s always busy. The staff are friendly and helpful, and the menu lists generous portions of local specialties, from Schnitzel with Grüne Soße (green sauce) to an excellent Sachsenhäuser Schneegestöber, an oniony cream cheese and Camembert spread sprinkled with paprika and caraway. If you have room for dessert, the non-local Apfelstrudel is very popular. Time Out tip: Fichtekränzi’s logo is a ring (Kranz) made of twisted branches of spruce (Fichte), which was the traditional symbol hung outside Apfelwein taverns for hundreds of years, denoting that Apfelwein could be found within.